Thank Cheri Steinmetz for Standing Up for Gun Owners! If you live in Senate District 3 (Goshen, Weston, and Niobrara Counties) please take a moment to read this! You see, Cheri Steinmetz has a history of standing up for gun owners and has pledged to do so again if elected to the Wyoming Senate, by answering her Wyoming Gun Owners Gun Rights Questionnaire. Sadly, Martin Gubbels has refused to answer key questions on his questionnaire. 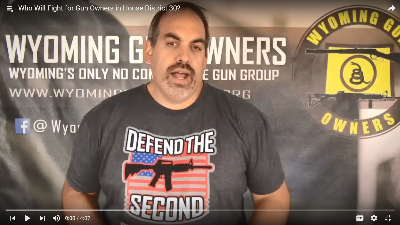 To explain more about which questions Martin Gubbels is ducking, please watch the video update that WYGO has prepared for gun owners living in Senate District 3! P.S. Gun owners in Senate District 3 need to see this! In your district, one candidate has previously stood up for gun owners and has promised to do so again — while another candidate is refusing to answer key questions on the Wyoming Gun Owners Candidate Questionnaire.